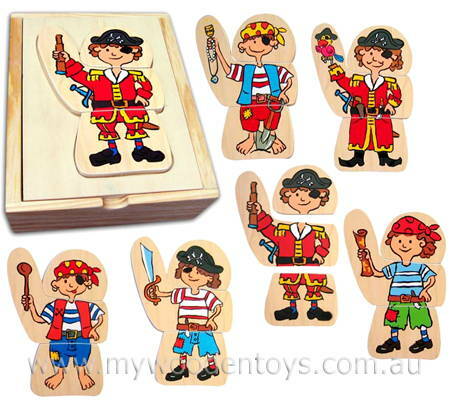 Dress Up Wooden Pirate Puzzle is a clever little organisation and matching toy. The puzzle comes in a wooden box with a cut-out lid. The cut-out is in the shape of a pirate and fits the puzzle pieces. You can mix and match the different pirate pieces and they fit snugly into the lid. There are seven versions of the swash buckling pirate all with three pieces so there are many possibilities to match and change. The box stores all the parts making this a neat take anywhere toy. Material: Wood with Gloss paper surface. We like this because: "Great simple toy fun to match and re-match whilst wearing your eye patch."